Object tracking is an important task within the field of computer vision. The proliferation of high-powered computers, the availability of high quality and inexpensive video cameras, and the interesting need for automated video analysis has generated a great deal of interest in object tracking. In its simplest form, tracking can be defined as a method of following an object through successive image frames to determine its relative movement with respect to other objects. In other words, a tracker assigns consistent labels to the tracked objects in different frames of video. One can simplify tracking by imposing constraints on the motion or appearance of objects. One can further constrain the object motion to be of constant velocity or acceleration based on prior information. Prior knowledge about the number and the size of objects, or the object appearance and shape can also be used to simplify the problem. 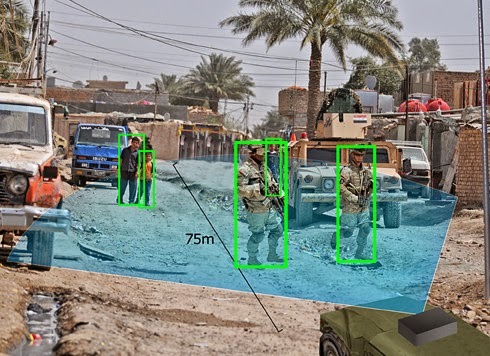 Numerous approaches for object tracking have been proposed. These primarily differ from each other based on the way they approach the following question: which object representation is suitable for tracking? Which image features should be used? How should the appearance and shape of an object be modelled? The answers to these questions depend on the context/environment in which the tracking is performed. A large number of tracking methods have been proposed which attempt to answer these questions for a variety of scenarios. Object tracking means tracing the progress of objects as they move about in visual scene. Object tracking, thus, involves processing spatial as well as temporal changes. Certain features of those objects have to be selected for tracking. These features need to be matched over different frames. Significant progress has been made in object tracking. Taxonomy of moving object detection is been proposed. Performance of various object detection is also compared.